What is your specialty? 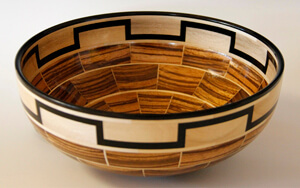 Turning segmented bowls, platters and bangles from both domestic and exotic woods from around the world. Awards, publications, recognition? I have written two books on segmented turning. 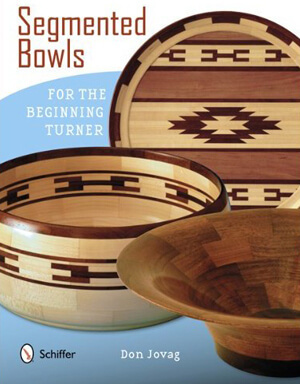 My first book, “Segmented Bowls for the Beginning Turner” provides step by step instruction on how to turn segmented bowls and platters. My second book, “Turning Wooden Bangles on the Wood Lathe” is due to be released in November 2015. Both books are published by Schiffer Publishing. Don Jovag, as you can see from the cover of his new book, is becoming famous for his food-safe wooden bowls and platters that feature intricate designs he creates with different colors and varieties of wood. When you actually touch and feel one of these bowls, you get an appreciation for the quality of his work, and his meticulous attention to finish and detail. Recently, Don started making beautiful and durable segmented wooden bracelets.